Last night, I had the good fortune to attend a special preview exhibit of the artwork of Rolling Stones Guitarist Ronnie Wood presented by Gallery 319. The event was held at Les Deux Café in Hollywood. Several of Ronnie’s celebrity friends showed up to support him, most notably his Rolling Stones band mate Mick Jagger. Also in attendance were Slash, of Guns and Roses fame, singer Kenny Loggins, and several members of the casts of CSI New York and CSI Miami. Although the event was star-studded, let’s not forget that the evening was about Ronnie Wood’s art. His art was displayed on the walls throughout the multi-room restaurant/nightclub, and images of his work were projected onto a screen on the enclosed outdoor patio bar area. The exhibition included both prints and originals. You can see some photos of the event at WireImage.com. 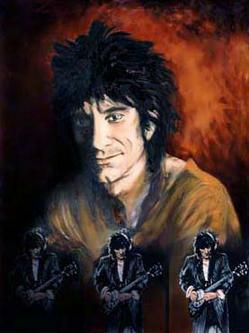 Visit Pop Life Art for links to online galleries of Ronnie Wood's artwork.